Curry is a spice that isn't commonly used in Haitian dishes. In fact, I can't really recall any kind of Haitian dish that uses curry. On another note, I still enjoy a good curry dish. Not just any kind of curry, but I really like Jamaican curry dishes. 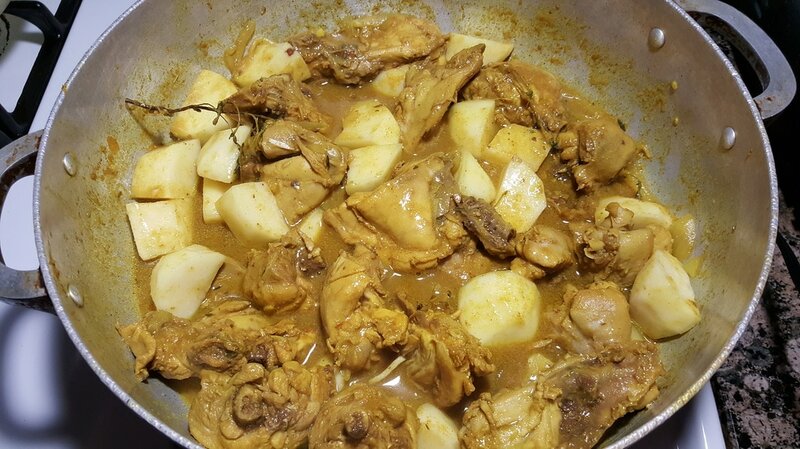 This is a basic chicken curry dish with potatoes. Although it's basic, it packs a lot of flavor. 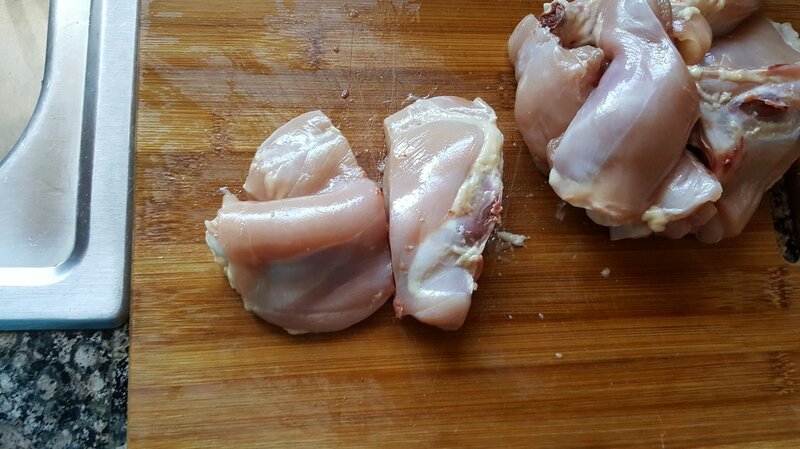 Since this recipe uses chopped up chicken leg quarters, a good chopping knife is needed. 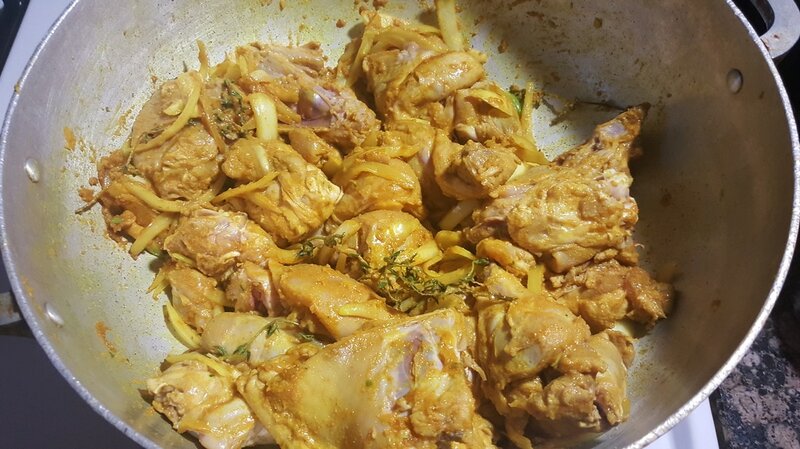 I have a different variation of curry chicken using boneless breast and boneless thighs with the addition of several vegetables. When that recipe becomes available, you will find the link here. 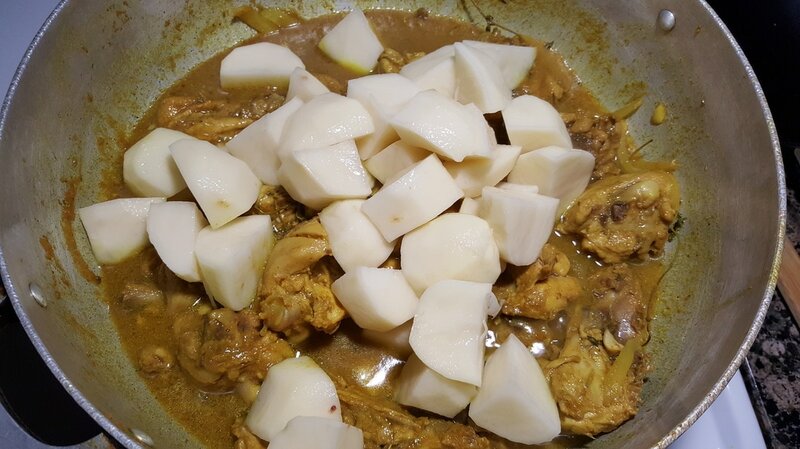 In the meantime, if you're in the mood for a simple curry chicken with potatoes recipe that is also delicious, definitely give this one a try. The chicken is tender, flavorful, and pairs very well with a side of white rice. What is also very important is the type of curry you use. 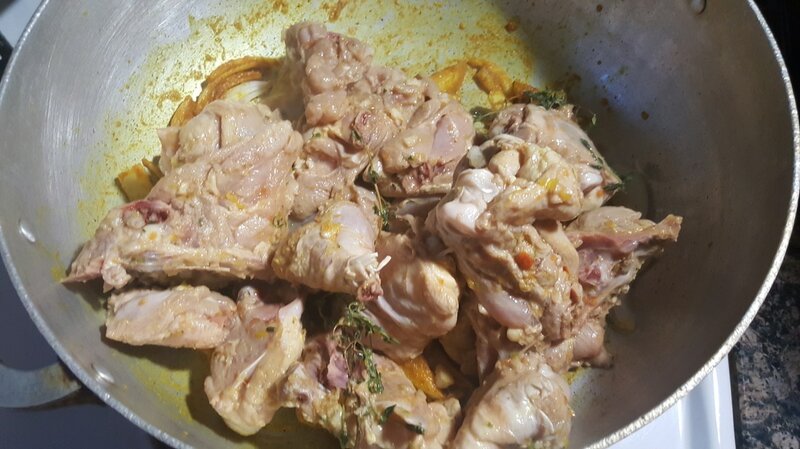 You want to use a real authentic Jamaican grade or West Indian curry. 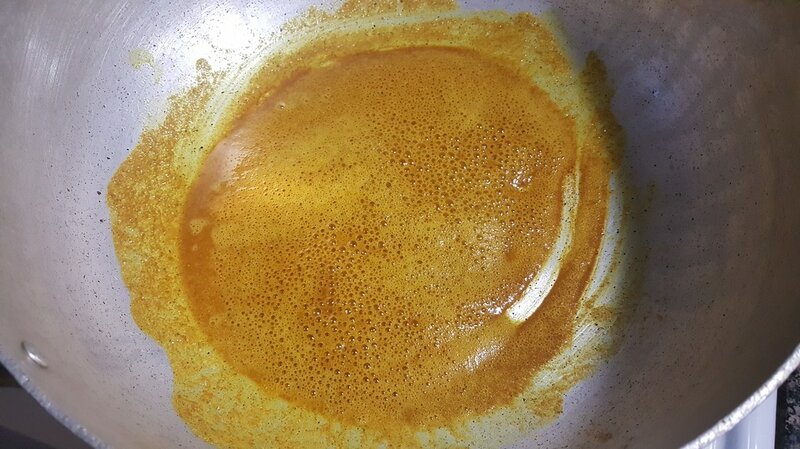 I find that certain curries don't produce the same distinct flavor and sometimes you end up having to use a whole lot more of the powder just to get the taste you're looking for. Blue Mountain Country is one of my personal favorites and provides the authentic Jamaican flavor I love. 1. 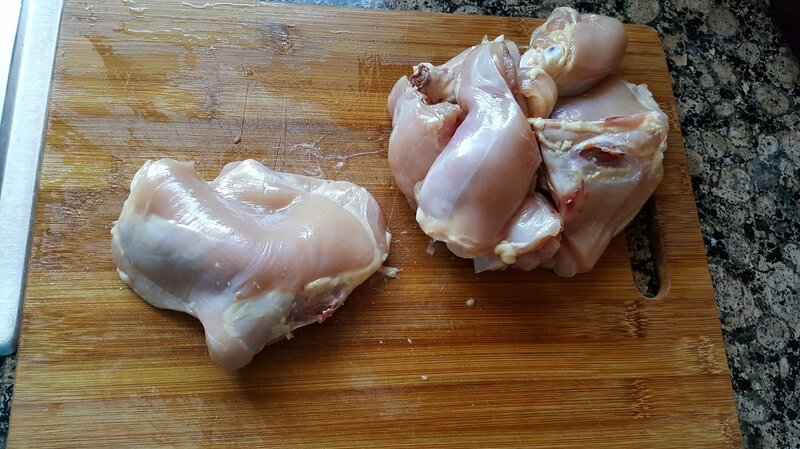 Clean the chicken leg quarters according to the “Cleaning Meat” page. Separate the thigh and leg pieces. Cut each thigh and leg piece into smaller sections using a sharp chopping knife. Cut the thigh in half. 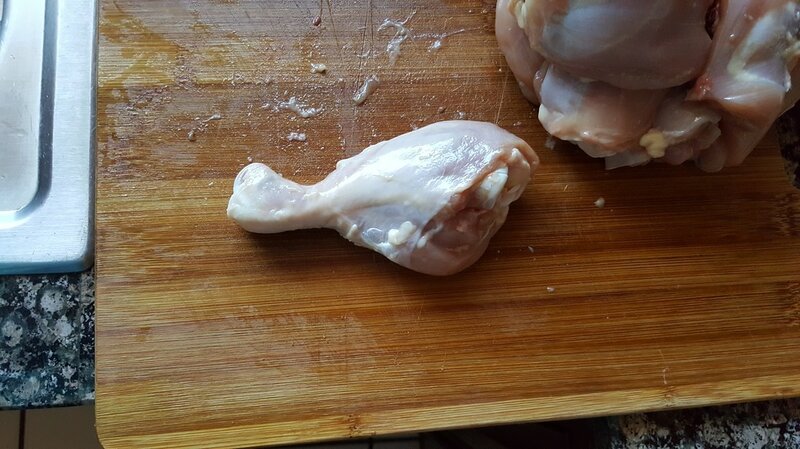 Cut the drumstick into 3 pieces. Discard the small end piece of the drumstick. Then, place all pieces in a large bowl. ​2. 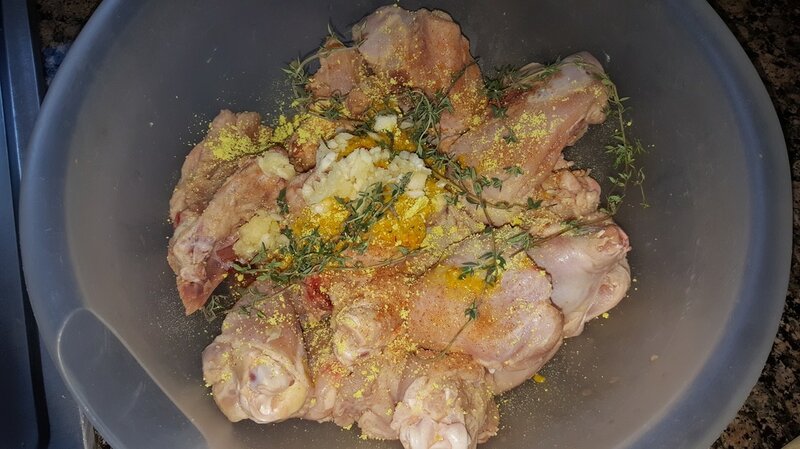 To marinate the chicken, add the following spices: 4 crushed garlic cloves, 1 tbsp. epis, ½ tsp. seasoned salt, ½ tsp. 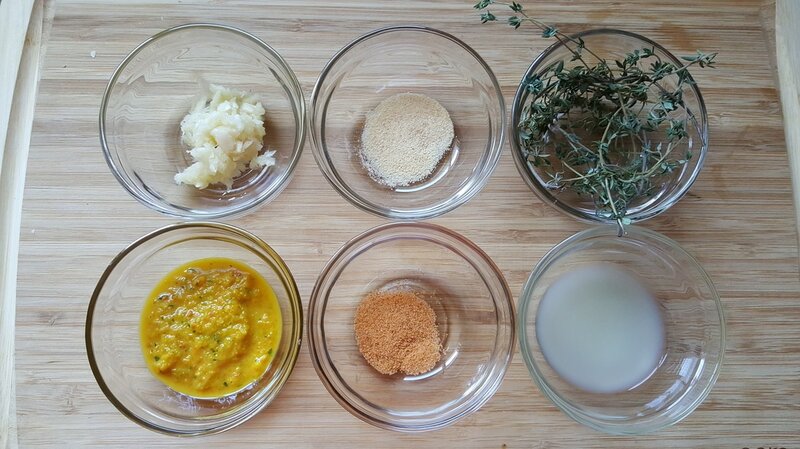 garlic powder, 5 – 7 sprigs of thyme, 1 tbsp. lime juice, and ½ crushed Maggie cube. Mix everything thoroughly in the chicken. Marinade at least 30 minutes or overnight. As always, the longer the better. ​3. 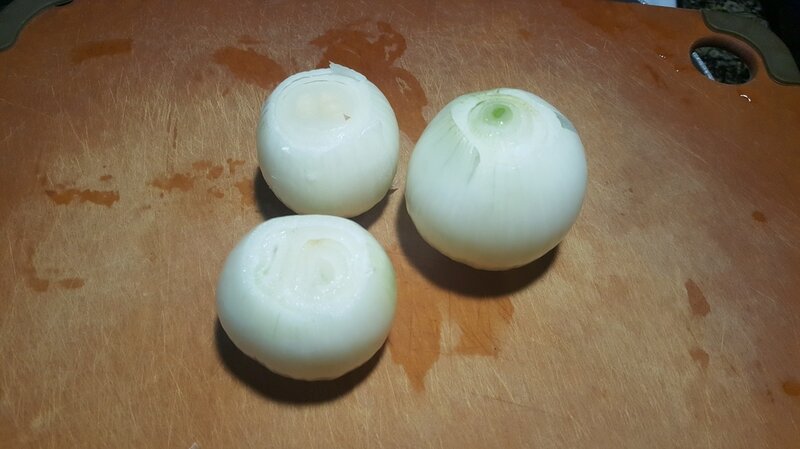 Slice 2 – 3 onions. 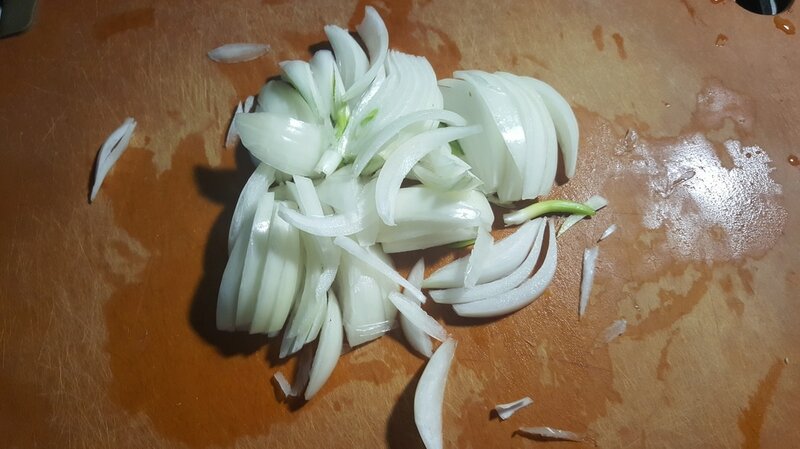 Set onions aside. 4. Peel, wash, and cut into 1 inch pieces 3 cups worth of russet potatoes. Set potatoes aside in a bowl of cool water to keep them from turning brown. I only had red potatoes when I was making this. Red and gold potatoes are waxier than russet potatoes. They will take longer to cook, so if you decide to use those, keep that in mind. Russet potatoes work best because they absorb the flavor throughout the entire potato. 5. In a pot on high heat, add 3 tbsps. of vegetable oil and 3 tbsps. 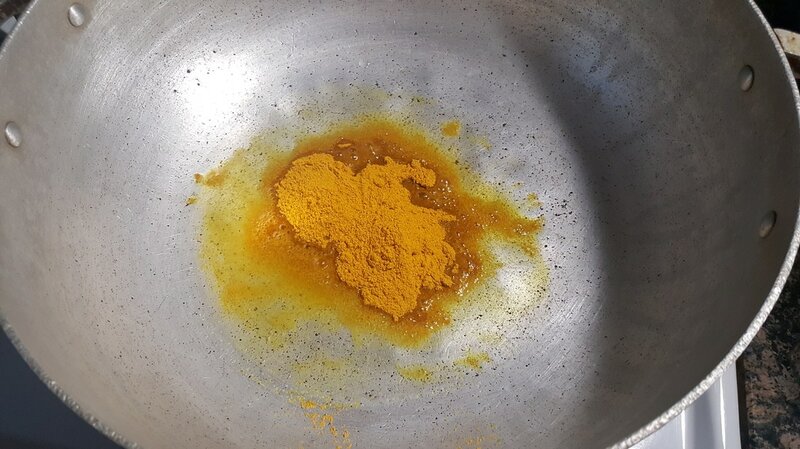 of curry powder. 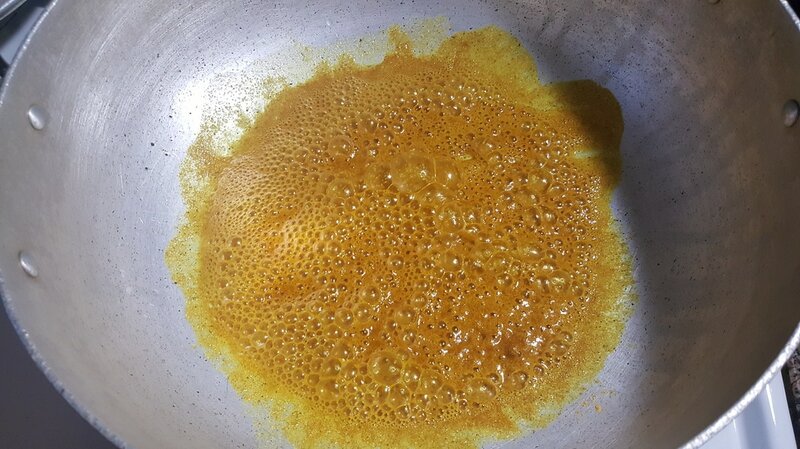 Stir the curry powder frequently and sauté for about 2 minutes, until it starts to bubble up. ​6. 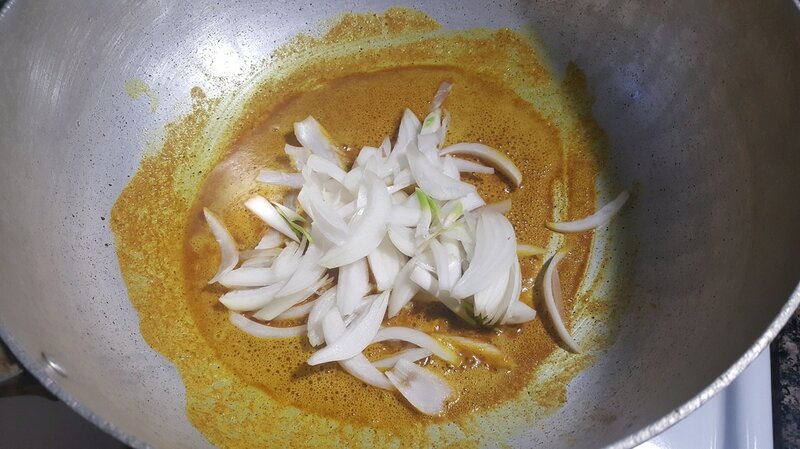 Add in the sliced onions and sauté in the curried oil for about a minute or so. ​7. Add in the marinated chicken, mix thoroughly and sauté for about 3 – 5 minutes. ​8. 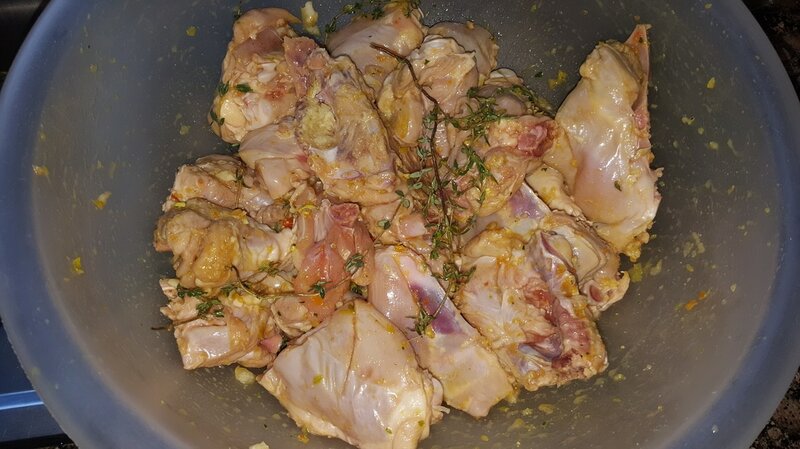 Add 1 ½ cups of water to the bowl that had the marinated chicken in. Use it to gather up any residual marinade and pour into the pot with the chicken. (If using a hot pepper, you may add it in at this time, whole.) Cover the pot and allow it to come to a boil, approximately 5 minutes. Reduce heat to medium and continue to cook covered for an additional 15 – 20 minutes. ​9. Add in drained potatoes and mix thoroughly. Based on your preference for sauce, you can add in an additional ½ - 1 cup of water. Be careful not to add in too much or else it will be too runny. The potatoes will also help to slightly thicken the sauce. Sample the liquid and add salt to taste if desired. Cook until the potatoes are tender all the way through, approximately 10 – 20 minutes, based on the type of potatoes you used. 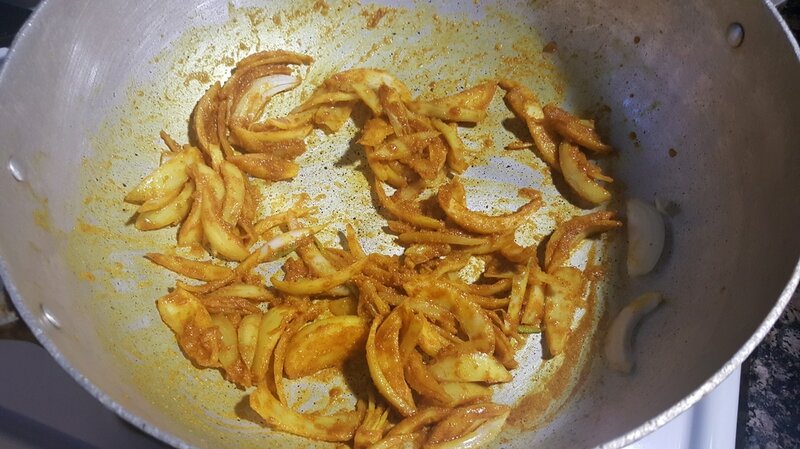 Take care not to overcook the potatoes so that they won’t break apart and crumble in the stew. 10. 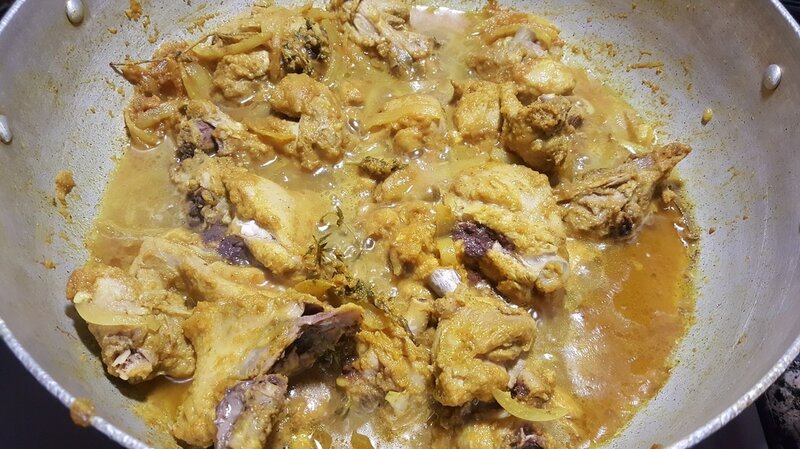 The curry chicken is ready to serve. Remove the twigs of thyme and the hot pepper (if it didn’t fully break apart) before serving. Try it with a side of white rice and enjoy. How do you like this recipe? 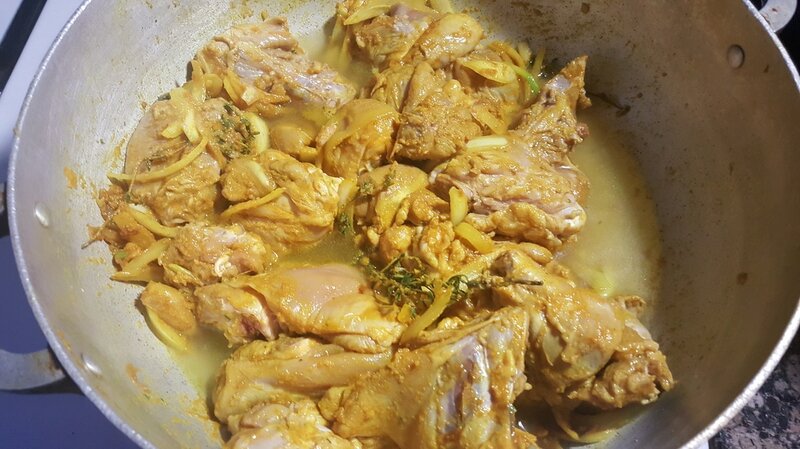 What other variations of curry chicken do you like?